The Association was formed shortly after the Second World War with the aim of maintaining contact between members by meetings and reunions.In the early days membership was confined to those of all ranks who had served with the squadron. This continued for some years but it was eventually realised that there were next of kin who wished to join. In order to accommodate these, the category of Associate Member was introduced. This was, and still is, only applicable to next of kin. In March 2006 Tom Gatfield, who had been secretary for almost forty years, died. I had agreed to take over by the end of 2006 so the line of succession was already in place. As the number of full members was steadily decreasing due to natural causes we decided to form two further categories of membership, namely, Friends and Honorary Friends. The former are people with a genuine interest in 49 Squadron whilst not having a direct connection. The latter are those who have done great service to 49 Squadron or the Association. Present day, 49 Squadron Association has 330 members of all categories, world wide, including over 105 members who actually served with the squadron. Up to 2013, reunions were held at the Petwood Hotel in Woodhall Spa and, weather permitting, we were treated to a flyover by one or more of the BBMF aircraft. View the stunning display performed for the 2012 reunion at the Petwood Hotel. Sadly, the 76th Reunion was the last in the current format. 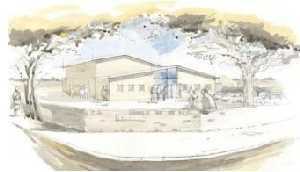 However, plans are being developed for an alternative format.....much to the delight of all members. 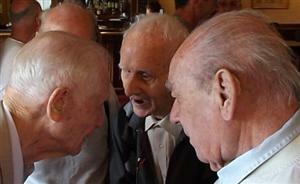 The picture shows three WW2 veterans Fred Hill (91), Eric Clarke (100) and Ted Cachart (89) recounting stories of operations in the Petwood Bar. During WWII, 49 Squadron flew from Fiskerton near Lincoln, and the 49 Squadron Lounge in the village hall has been named in honour of the squadron. We have close ties with the modern day Royal Air Force and have visited a number of RAF establishments. Prominent among these is RAF Scampton where we are cooperating with the museum where plans are afoot to open a 49 Squadron Room. We have also been privileged to enjoy some private displays by the Red Arrows. In addition the BBMF at Coningsby have honoured us with special flyovers including many cemeteries in which 49ers lie. To preserve for posterity the memory of those who served and died with 49 Squadron. 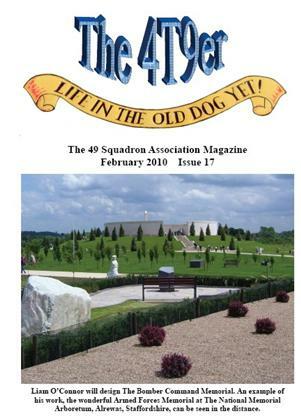 Keeping members in touch with one another by a quarterly magazine and reunions. Tracing old friends and comrades. Researching and providing information for relatives of former 49ers. Supporting members who are lonely and depressed in their later years. New members of all categories are always welcome. The Association has close links with the village of Fiskerton. Every year the reunion is made welcome at the Parish Church and the Village Hall. The Village Hall during the 2011 Reunion. The wonderful lunch provided by the Village Hall. The website of the Fiskerton Village Hall.